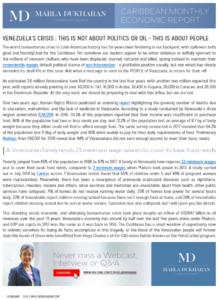 (Marla Dukharan, 4.Feb.2019) — The worst humanitarian crisis in Latin American history has for years been festering in our backyard, with spillovers both good and (mostly) bad for the Caribbean. Yet somehow our leaders appear to be either oblivious or willfully ignorant to the millions of innocent civilians who have been displaced, starved, tortured and killed, opting instead to maintain their conveniently myopic default political stance of non-intervention – a justifiable position usually, but one which has clearly exceeded its shelf-life in this case. And what a message to send to the PEOPLE of Venezuela, in return for their oil! An estimated 3.6 million Venezuelans have fled the country in the last four years, with another two million expected this year, with reports already pointing to over 40,000 in T&T, 16,000 in Aruba, 36,400 in Guyana, 26,000 in Curacao, and 28,500 in the Dominican Republic. At the very least, we should be preparing to deal with this influx, but we are not. Over two years ago, Human Rights Watch published an alarming report highlighting the growing number of deaths due to starvation, malnutrition, and the lack of medicine in Venezuela. According to a study conducted by Venezuela’s three largest universities (ENCOVI), in 2016, 93.3% of the population reported that their income was insufficient to purchase food, 86% of the population had two or less meals per day, and 72.3% of the population lost an average of 8.7 kg of body weight because they either could not find or afford enough food. The same survey conducted in 2017 revealed that 64.3% of the population lost 11.4kg of body weight and 90% were unable to pay for their daily requirements of food. Preliminary findings from ENCOVI for 2018 reveal that 94% of Venezuelans did not earn enough income to meet their basic needs. Poverty jumped from 45% of the population in 1998 to 87% in 2017. A family in Venezuela now requires 23 minimum wages just to cover their basic food needs, compared to 2 minimum wages when Maduro took power in 2013. A study carried out in July 2018 by Caritas across 7 Venezuelan states found that 65% of children under 5 and 49% of pregnant women were malnourished. Meanwhile, there has been a resurgence of previously eradicated diseases such as diphtheria, tuberculosis, measles, malaria and others, since vaccines and medicines are unavailable. Apart from health, other public services have collapsed; 71% of homes do not receive running water daily, 25% of homes lose power for several hours daily, 22% of households report children missing school because there isn’t enough food at home, and 28% of households report children missing school due to cuts in water service. Sanitation has also collapsed, but I will spare you the details. This shocking social, economic, and ultimately humanitarian crisis took place despite an inflow of USD947 billion in oil revenues over the past 19 years. Venezuela’s economy has shrunk by half over the last five years alone under Maduro, and GDP per capita in 2017 was the same as it was back in 1955. The Caribbean has a small window of opportunity now to redeem ourselves for being de facto accomplices in this tragedy, or the blood of the Venezuelan people will forever stain the hands of those who benefited from Hugo Chavez’s oil-for-OAS-votes (better known as the PetroCaribe) program.